This scientific computer had characteristics which were incredible. It had a 170 MB hard disk, when other computers used 10 MB hard disks! It was designed to make CAD or artificial intelligence applications. It used a graphic interface very similar to the Macintosh one (!) and was sold with a mouse. Several languages were supplied with the computer: Lisp, C, Fortran and, InterLISP (developed by Xerox). It used a custom CPU, the 68000 was used to run the keyboard, the mouse and to boot the main processor. The main processor had an architecture derived from the MIT CADR Lisp machines. In 1983, it cost about $110,000! I worked for Symbolics in the UK until the company went into chapter 11. I then bought the UK stock to provide support to UK and European users. The 68000 processor was used to bootstrap the LISP processor. The processor on the 36XX systems had a 36 bit wide word, 32 bits data 4 bits data type. The processor was integrated onto a single CPU, the Ivory, then used 32 bit data , 8 bit data type. This CPU used in systems MacIvory, XL1200 and NXP1000. 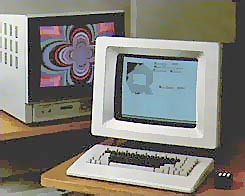 The Symbolics family of computers were designed to run LISP more or less directly. So the OS was also written in LISP. It was known as Genera. I still have the manuals for Genera 8. The primary display is a monochrome bitmap display, black text on a green-grey-white background. Very easy on the eyes. Manufactured by Symbolics, Inc. I also have a pair -- a 3650 and 3620, both later models. The native LISP that Symbolics ran was Zeta-Lisp and the built in editor was Z-MACS, a version of the emacs editor. I have a pair of 3620 machines complete with monitors, keyboards and documentation that I bought at an auction in the mid 1990s. The machine used additional keyboard modifiers for extended commands; so the keyboards have super, hyper and meta keys in addition to the normal key set. The earliest 3600s were about the size of an 18 cubic foot refrigerator. They stood about five feet tall by about 2.5 feet wide and three feet deep. The 3620s that I have are only slightly larger than current desk side Intel machines, but the Symbolics are much heavier. see more Scientific Computer SYMBOLICS 3600 Ebay auctions !